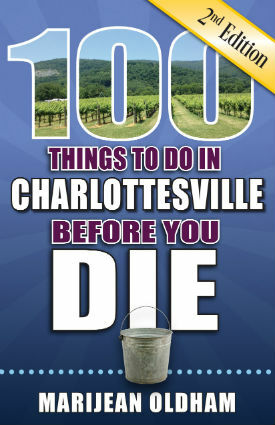 Author Marijean Oldham will be holding these upcoming events to promote her new travel book, 100 Things to Do in Charlottesville Before You Die, 2nd Edition. Thursday, September 20 starting at 7 p.m. Happy Hour from 8 p.m. to 11 p.m.
Saturday, September 22 starting at 1 p.m.
For a small Southern-ish town, Charlottesville sure packs a lot into its geographic footprint. A destination for history buffs, the town is central to the homes of three U.S. presidents, Thomas Jefferson, James Madison, and James Monroe. An academic and college sports attraction, the University of Virginia—designed, built, and founded by Thomas Jefferson—is a large presence in the town. Bordered by the Blue Ridge Mountains and just two hours southwest of Washington, DC, Charlottesville is a cultural powerhouse with deep roots. Let this book be your guide to all the delightful activities and a roadmap to the true flavor and feeling of today’s Charlottesville. Whether you’re people watching on the downtown pedestrian mall or hanging out on the Corner at UVa, we have the comprehensive list of Charlottesville to-dos, which should keep you busy from now until you die.